How to Make a King in Debt. Once more the Fairy Tail wizard guild is thrown into the thick of it as they deal with the aftermath of the Grand Magic Games and the black magic Eclipse Gate. Look to the Heavens for there is about to be a star studded battle. The Fairy Tail guild are thoroughly embroiled in the battle with the rebellious Celestial Spirits that Lucy and Yukino normally co-habit with in their day to day magical exploits. After the challenges of the Grand Magic Games and the trouble with the threat of thousands of dragons taking over the world, now the celestial spirits that normally happily serve Fairy Tails Celestial wizards have gone rouge and have no memory of their friendship with the humans and they want to live in freedom and not in servitude. 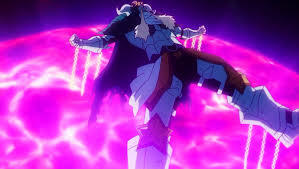 The fights with each individual zodiac sign has been going on and now Erza faces Sagittarius in a three fais duel and the winner goes forth and the looser will retire from the field of battle. Meanwhile in the human realm Hisui and Arcadios watch the goings on in the Celestial realm trying to figure out what the end game will be, they reach Ophiuchus’s dimension and deduce that the snake spirit is acting on behalf of the Celestial Spirit King who is now under the thralls of the black magic from the Celestial Gate. They battle the Celestial Spirits and now the fight the Celestial King who looks nothing like the King they know, until Natsu launches himself;f into thje unknown once again and finds a familiar visage. The fight is on to save their common knowledge and save Lucy’s friends from certain death. Another great original anime from team Fairy Tail. Bring on the new arc. 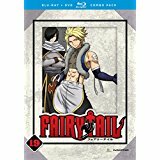 Fairy Tail 19 is available on Blu-ray and DVD.